Linfield have announced three signings - and 11 departures - as the champions’ summer transfer dealings begin. As was reported by the News Letter last week, Jordan Stewart and Robert Garrett have both joined David Healy’s side, as has Crusaders defender Andrew Mitchell. “Firstly, Robert Garrett has signed for the club from Portadown on a two year contract,” said Healy on the club website. “Robert needs no introduction to Linfield supporters as he enjoyed considerable success here in his previous spell with the club. “Secondly, Andrew Mitchell has signed for the club from Crusaders on a three year contract. He is a player who I’ve admired and who will increase competition for places within the squad. “Furthermore, I’m also delighted to confirm that Jordan Stewart has agreed to join us on a pre-contract at the start of the new season. “I’d like to welcome Robert, Andrew and Jordan to the club and I’m looking forward to working with them once we return for pre season training. The summer clearout has also begun at Windsor Park with no less than 11 players confirmed to be leaving the club. Former Glentoran defender Sean Ward is named alongside ex international Sammy Clingan, Ross Gaynor, Jonny Frazer and forwards Michael McLellan and Kris Bright in a list of players that have been advised that they won’t be at Linfield in the season ahead. Those six players are joined by TJ Murray, Seanna Foster and Adam Salley, who spent this season on loan at Carrick Rangers. Salley signed a pre-contract agreement with relegated Portadown earlier in the season. 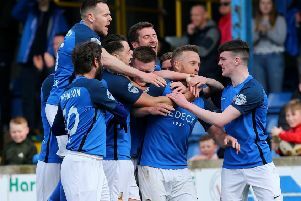 Linfield also confirmed that David Kee, who missed Saturday’s Irish Cup final as he is on loan from Linfield to Coleraine, will not return to Windsor Park when his deal at the Bannsiders expires. Goalkeeper Ross Glendinning, meanwhile, is set to make his loan deal at Ballymena United permanent.